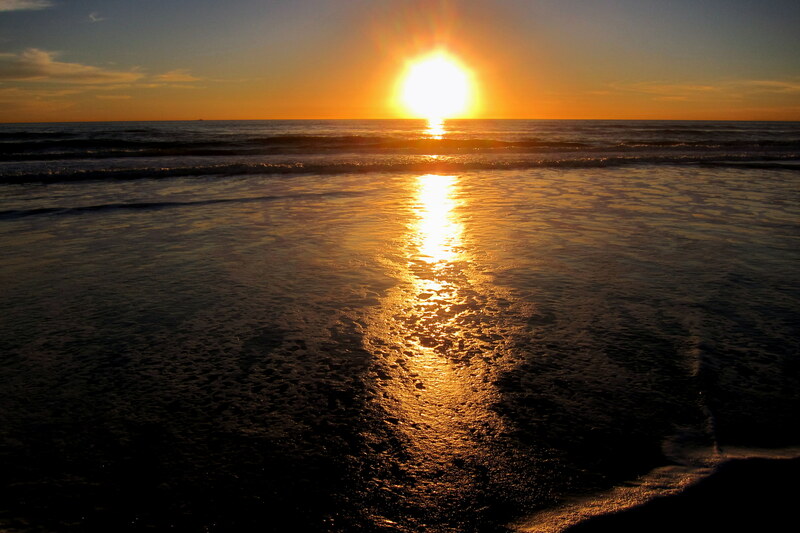 Sunday, February 15, 2015: This morning the sun rises over beautiful Del Mar Beach as we reluctantly prepare to depart our oceanfront camping paradise…..however we are excitedly looking forward to our next adventure. Yea, ya got me! We are on the left coast and the image above actually shows last night’s sun setting over the Pacific. I‘m shameless when it comes to inserting sunset photos into this journal. It is simply not possible to take a bad photo of the sun setting over a body of water. Whereas many of my other snapshots barely reach the level of mediocrity, sunset photos always seem to come out stunningly. The weather is California perfect as we pull out of Oceanside and hop on The Five heading south where we immediately come to a slow crawl! It’s ten AM folks…..don’t you have to be at work or in school? Oh, it’s Sunday…..as a retiree it is so easy to forget days of the week, or time of the day, or to put your pants on. We finally increase to a gentle trot and meander south. From The Five, we follow The Seventy-Eight to The Fifteen which leads us to The Fifty-Two and on into the Santee valley, where the traffic moderates somewhat. No one out here refers to any highway by their given names, like “Interstate Five” or “California Highway Fifty-Two” it’s always The Five or The Fifty-Two……The Californians can be a bit unusual! 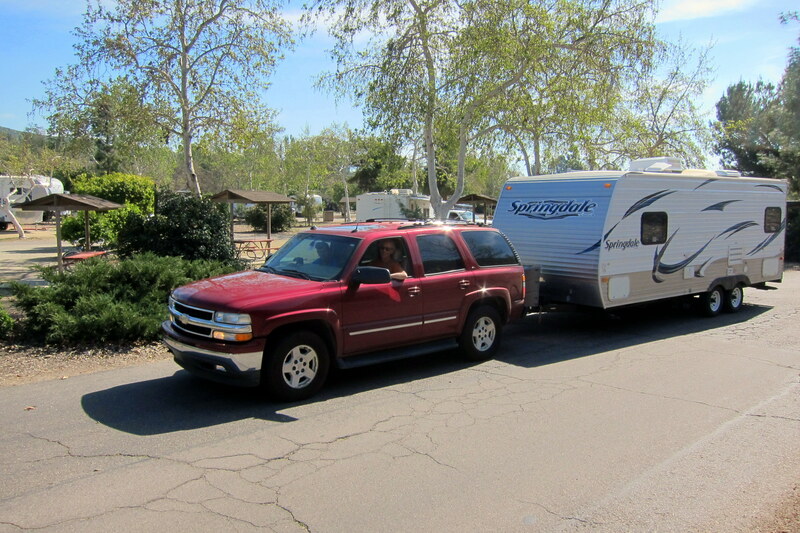 After a bit more than an hour on the road, we return to our newest favorite San Diego area camping facility….. Santee Lakes Regional Park and Campground. This time around, Kit and I are looking forward to an important event and an opportunity to camp with my bruzzin, Dewey and sister-in-law, Bea and our mutual brother Dan. 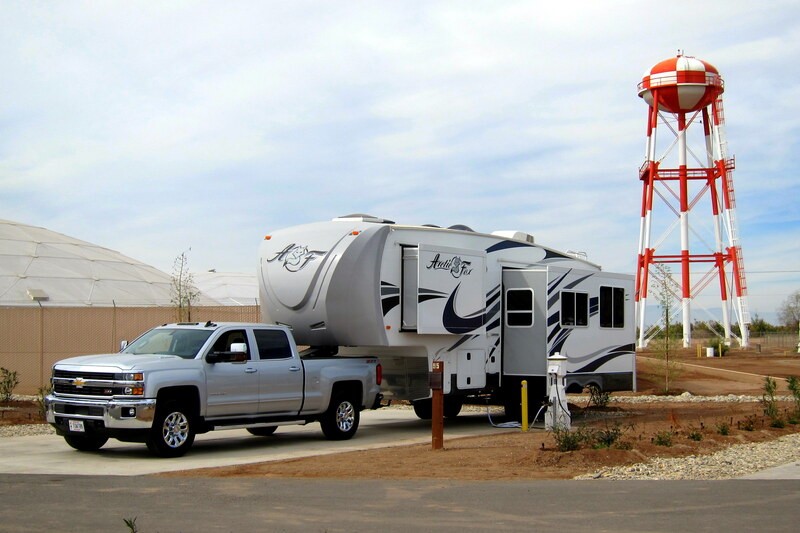 Monday, February 16 through Thursday February 19, 2015-Santee Lakes RV Park, California: It is getting into prime RV season for folks in this neck of the scrub brush and we couldn’t score any of our favorite sites due to the park being near capacity…..however we did select the nicest of what was available. And it was right next door to the site that Dewey and Bea selected and soon they arrived from Tucson, Arizona with their camper in tow. Our other brother Dan also drove in from Tucson and stayed with us in our camper. 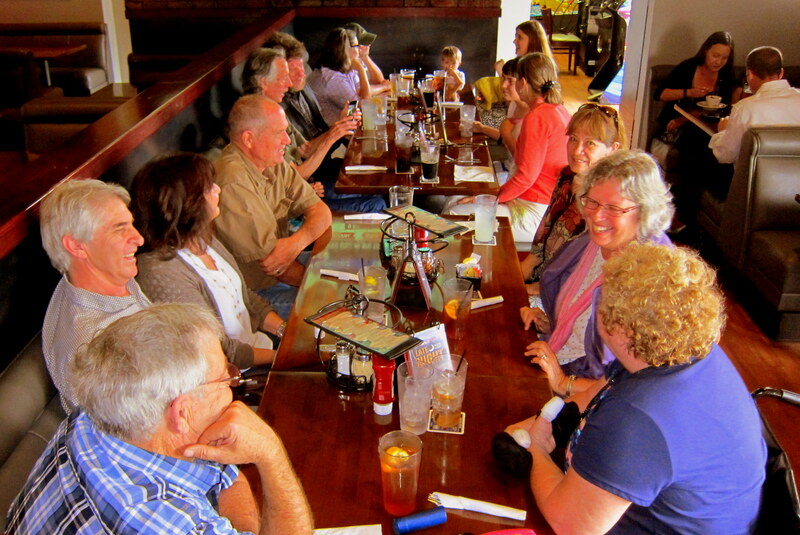 After enjoying a meal, drinks and conversation we finalized preparations for our mother’s Military Memorial ceremony. Mom passed in March of last year. 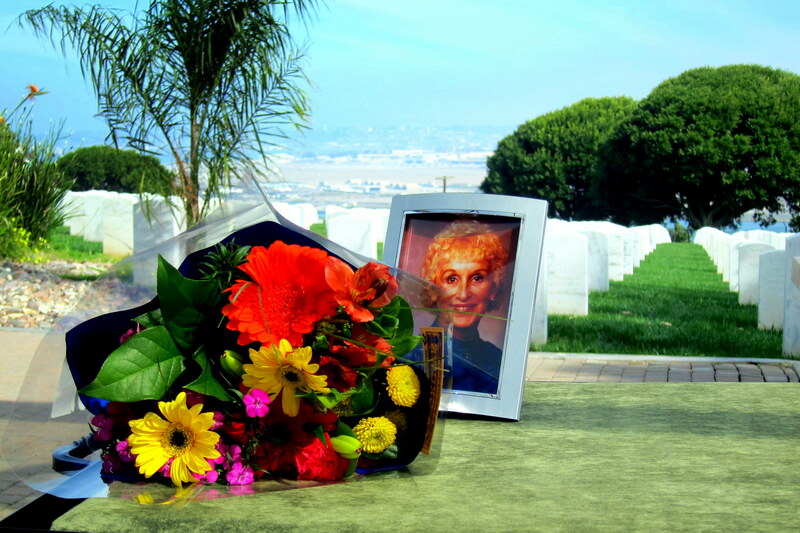 Over the past eleven months, she has traveled with us to visit her place of birth, then to our home in Maine, back to her beloved Arizona and finally to her eternal place of rest in the family’s hometown of San Diego. Mom has visited more areas of the country since her passing than many folks visit in their lifetime…..sad but true. 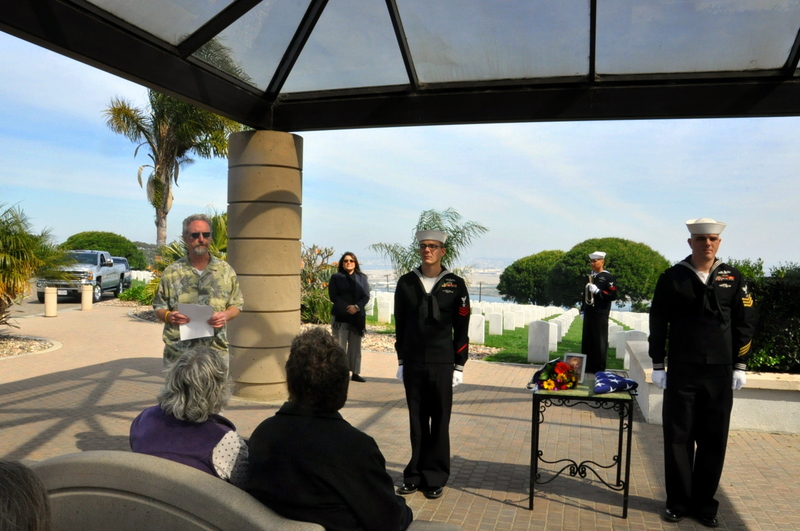 On Ash Wednesday, west coast friends and family gathered at beautiful Fort Rosecrans National Cemetery located on Point Loma in San Diego, California. It was a typical coastal California winter day, plenty of sunshine with a gentle onshore breeze. I cobbled together some words highlighting mom’s remarkable life followed by a few symbolic spiritual quotes and concluding with the Lord’s Prayer. It was with great love and humility that these words were read as a few of America’s finest stood at respectful attention. Next a bugler played the haunting melody of Taps as we all stood and rendered the appropriate honors. 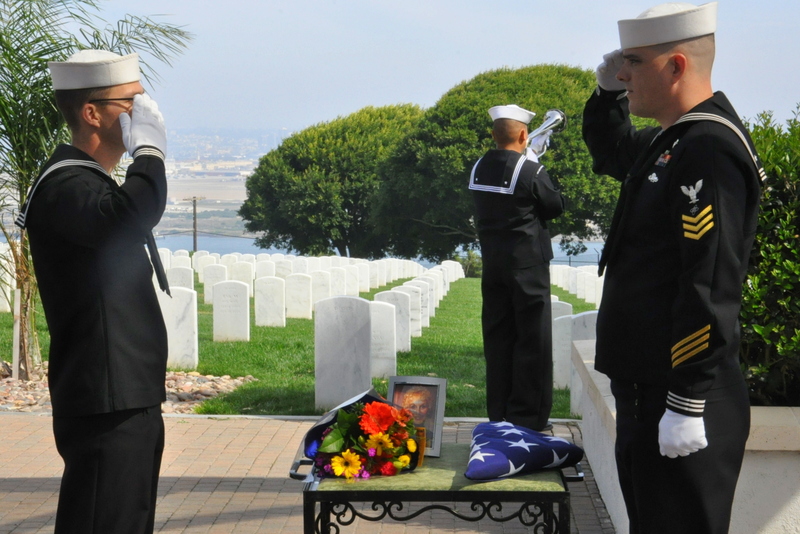 The family chose our brother Dan to receive the burial flag…..this is a traditional symbol of the nation’s gratitude to mom for serving her country during time of war. Many of the West Coast family were in attendance as well as a few old friends. Following the Military Honors, we strolled to the Columbarium Wall to view mom’s niche and pay final respects before gathering at a local tavern for food and fellowship. 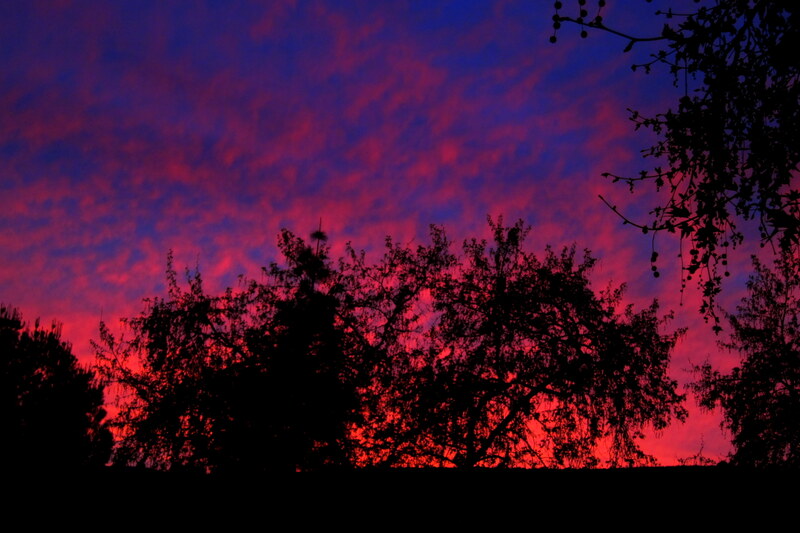 Then, as the evening wound down we were treated to a spectacular sunset! Thanks mom! And thanks to Dewey and his son Kevin for taking some great photos that I can share with family in the far flung corners of our nation! 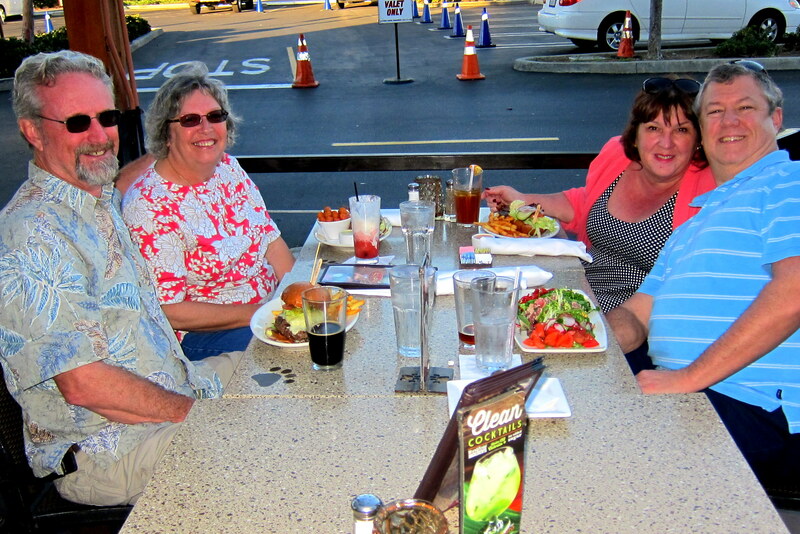 Also while in the area, Kit and I were able to meet some friends from my days of work at Lockheed. 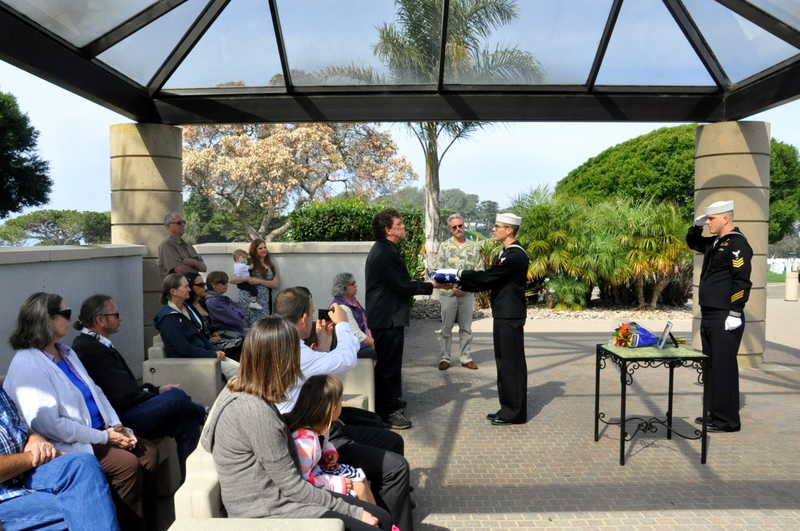 Scott and Marie now live in San Diego while Scott manages the Navy’s Aegis Modernization Project for the region. He and I worked at the Bath Iron Works before Scott had the good sense to accept an assignment in beautiful San Diego. 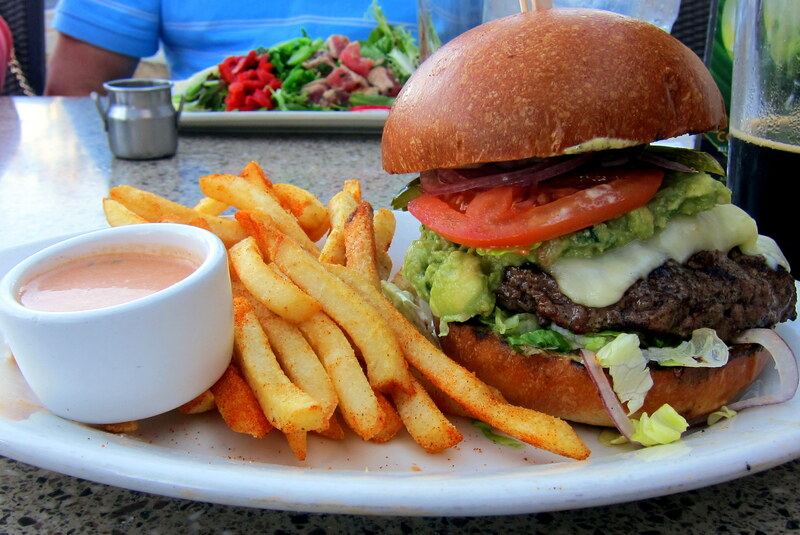 We met at The Lazy Dog Restaurant and enjoyed some of the best hamburgers and micro brews in the area. Later on Dave, another Maine expatriate, joined us and the story telling continued. We had a great time reconnecting with old friends and catching up on each other’s news…..thanks guys, hope to see you again next year! 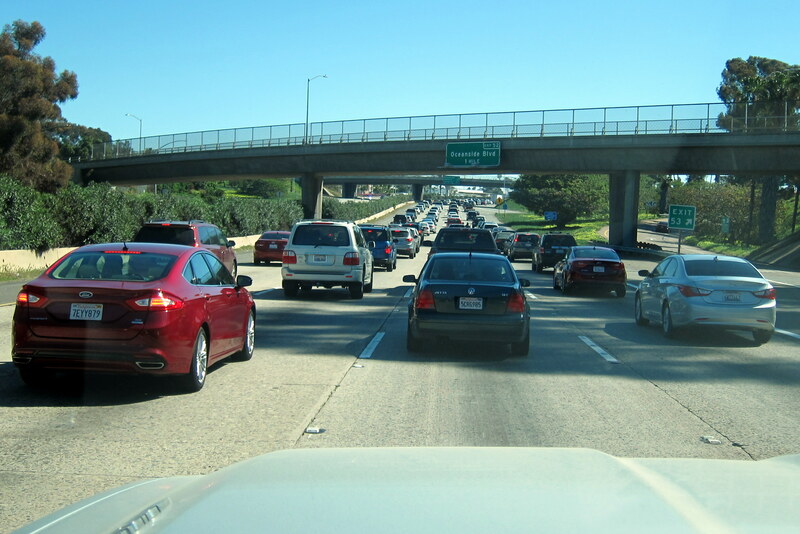 Along the highways of Southern California, we have come to expect various high end and exotic automobiles moving about. In addition there appears to be more antique and modified cars than anywhere else in the country. 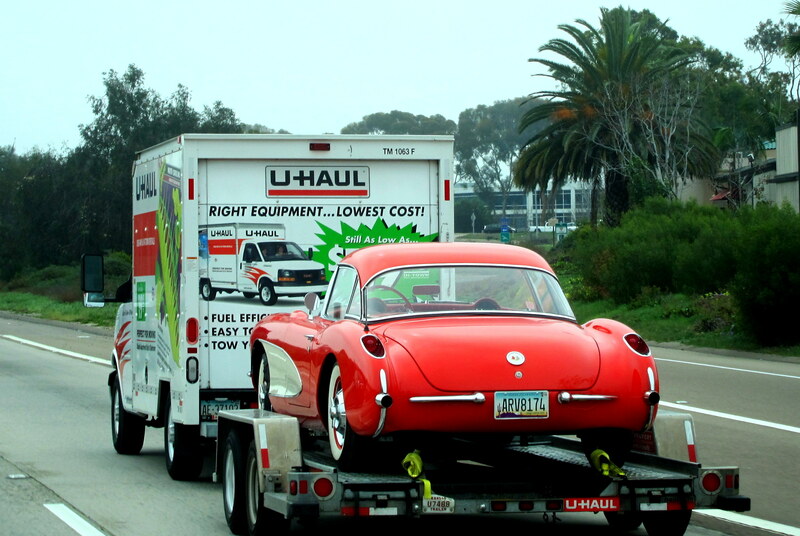 However seeing an antique Corvette being pulled by a U-Haul trailer is a rare sight! Yea, I know…..for those of us at a certain age, the terms “antique” and “Corvette” do not seem to go together! A mid 1950’s Classic worth upwards of $100,000.00 being hauled by a rental truck seemed odd…..if the fellow could afford a nice collector car, he should be able to get someone to move him!?!? With our new rig, carrying my bike was an issue. Previously it rode in the bed under a truck cap…..however with the fifth wheel configuration that is no longer possible. 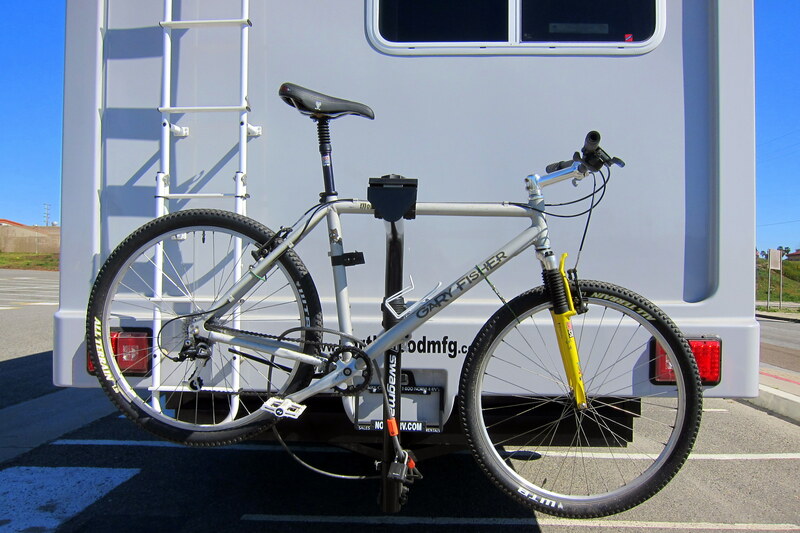 So I picked up a bike rack that attaches to the trailers two inch receiver. Time will tell whether this is an acceptable solution……I may have to raise the rack some in order to provide better ground clearance. Oh, and the sharp eyed reader may notice that particular bike is one I “rescued” from the desert last year and have since restored. 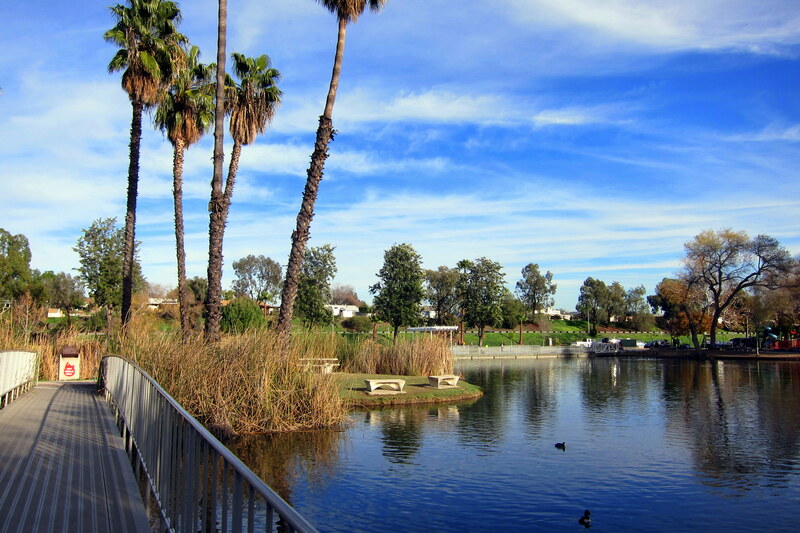 Speaking of bikes, Santee Lakes is a great place to ride. There are trails that wind through the property including one that encircles the chain of lakes. 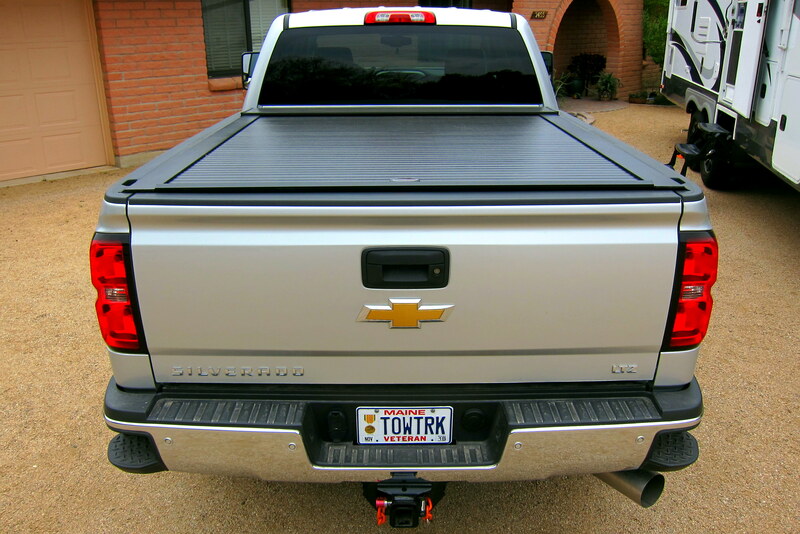 Now a quick note about the tonneau cover I selected for the truck. When we last left our analytical (Kit would say the correct spelling of that word leaves off the last six letters) truck owner he was investigating the best truck bed cover that would work with the fifth wheel configuration and protect the truck beds contents when the camper is disconnected. Well, he made a pilgrimage to the factory of Truck Covers USA and received ample information from a highly motivated and knowledgeable employee who turned out to be the CEO! Here is the result. 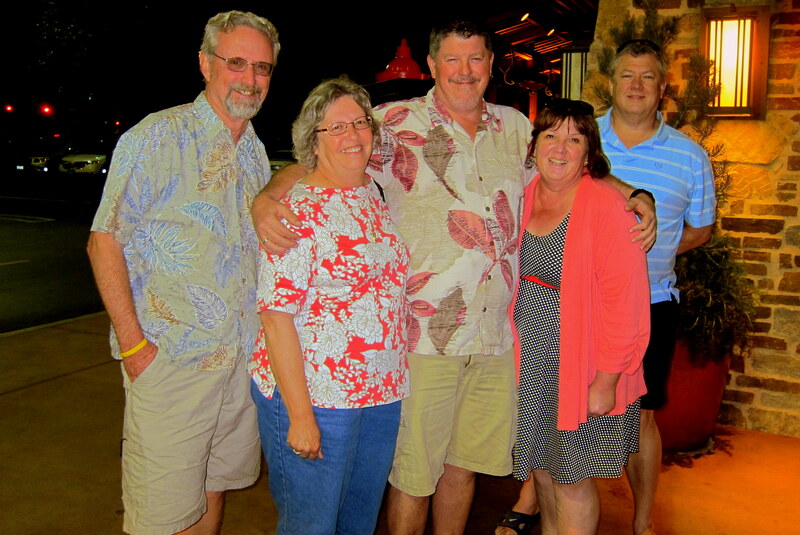 Our final evening consisted of the family getting together with our friend Rodney and his wife Gloria who reside in Tecate, Mexico. We enjoyed a nice barbeque, great conversation and some quality cerveza! 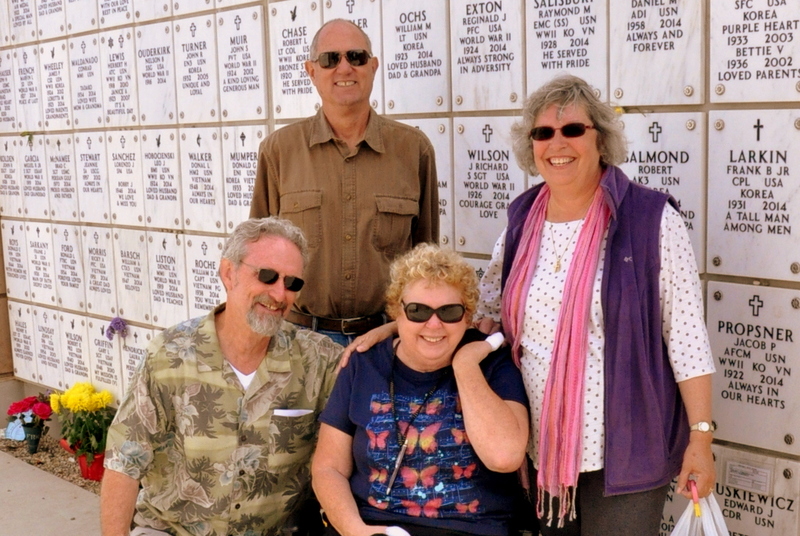 Here is a picture of Rodney, or friend JoAnne, Kit and I that was snapped up at Fort Rosecrans…..it was the first time the four of us has been together since 1963! And, we haven’t aged a bit! Friday, February 20, 2015: Underway at 1130 from Santee, California under partly sunny skies and a temperature of 75 degrees. 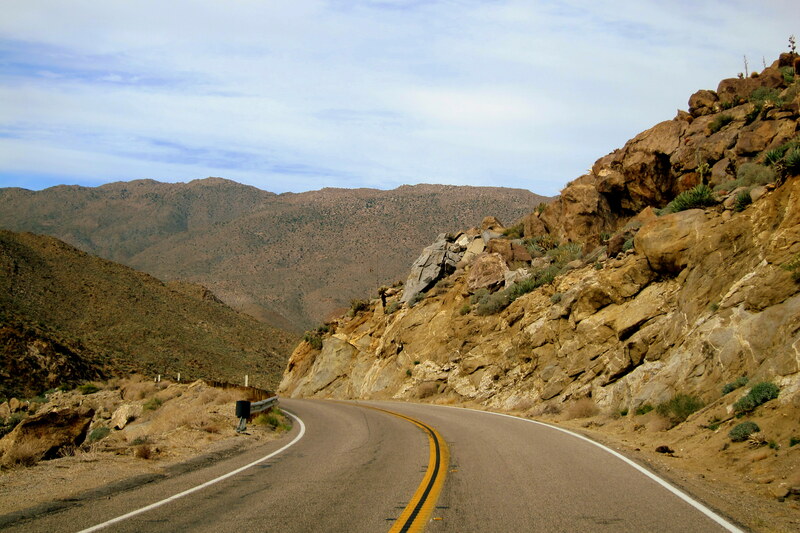 Our goal was to spend a few days at Anza Borrego State Park in the California desert…..however it’s Friday. And the desert wildflowers are blooming. And, as usual, we didn’t plan ahead and make reservations. And the weekend forecast is for perfect weather. And we lose! Yep, all 149 camp sites are reserved! So off to plan B, annnd we don’t have a Plan B…..will have to figure it all out later in the day. 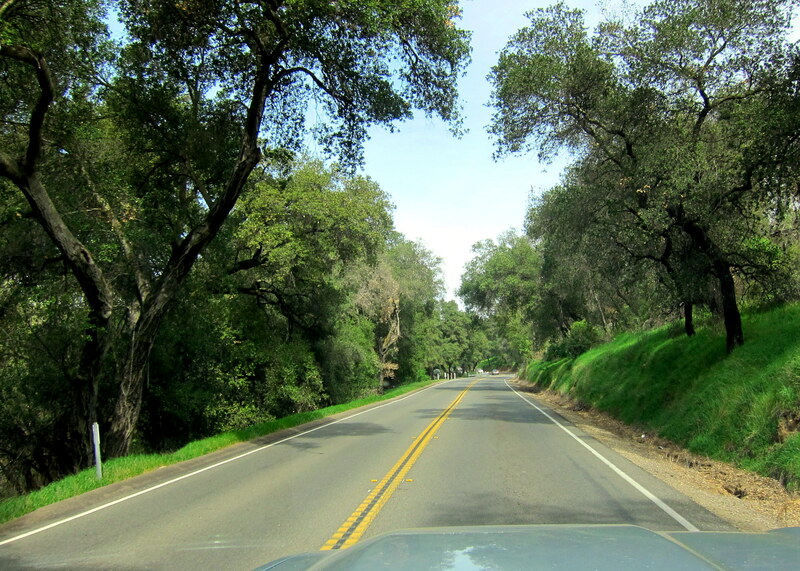 Kit and I decided to take CA-67…..a far more scenic route which winds through Sycamore Canyon before climbing into the Santa Rosa Mountains. 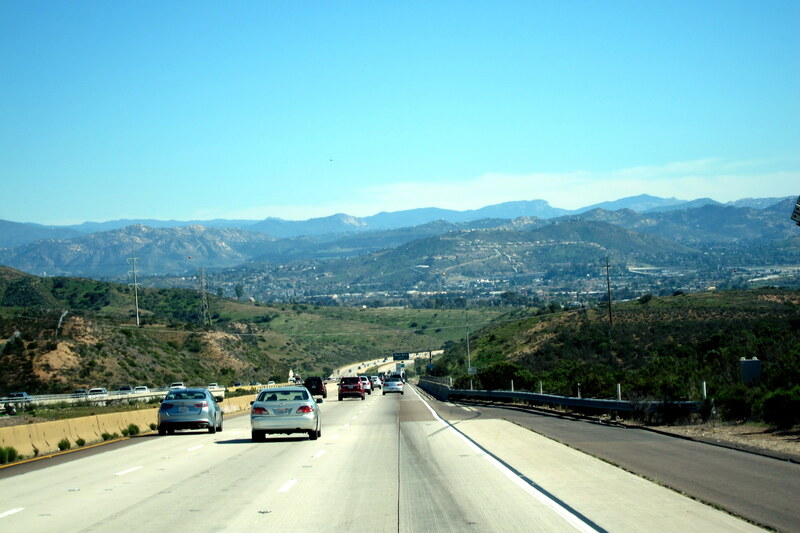 It then traverses the Cleveland National Forest on its way to the town of Ramona. 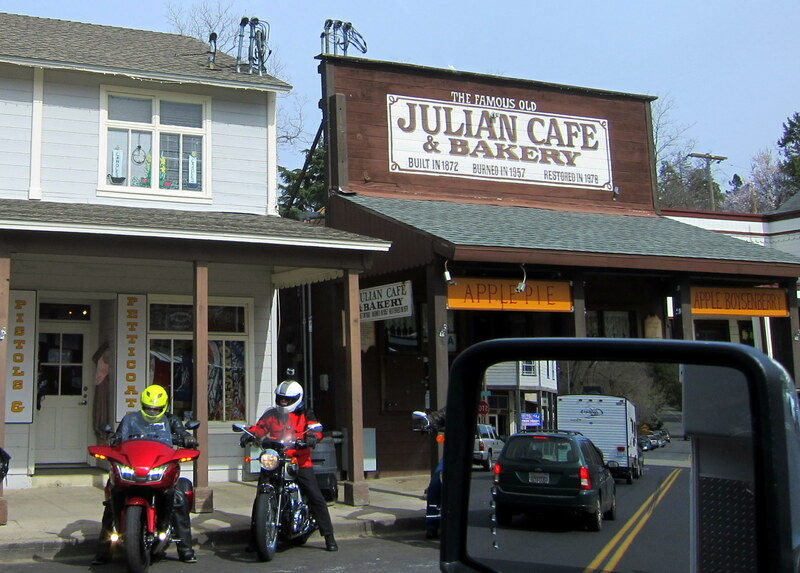 After a brief stop for groceries, we join CA-78 and continue easterly toward the town of Julian. Topping out at 4,275 feet we begin to lose altitude as we drop into Grapevine Canyon. 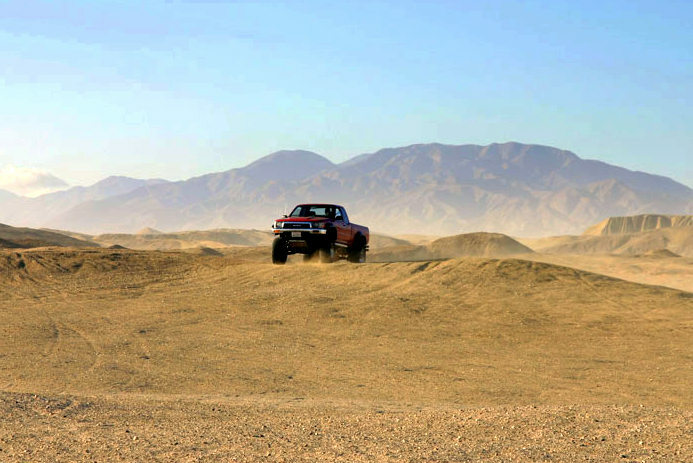 Being a Friday, there are a lot of RV’s on the road…..many pulling four-wheelers and dune buggies heading for the Ocotillo Wells SVRA (State Vehicle Recreation Area). Nearing our self-imposed quitting time (300/300), Kit researches a few camping opportunities in the area but nothing suitable pops up, so we continue east toward the Salton Sea. What does 300/300 mean? Well ever since the 2008 Excellent Adventure some seven years ago, we found the need to establish a policy on when to stop for the day. Back then I was a bit manic as I wanted to see as much as possible and not squander any daylight. This mode of travel resulted in long tiring days, late night arrivals, and a bit of marital disharmony. I’ve mellowed a lot as I have aged and now our daily travel routine is to be off the road when we have traveled 300 miles or when the time reaches 3:00 PM. Skirting the southwestern shore of the Salton Sea Kit kept searching for a nice place to stop for the evening…..but alas there is nothing available. 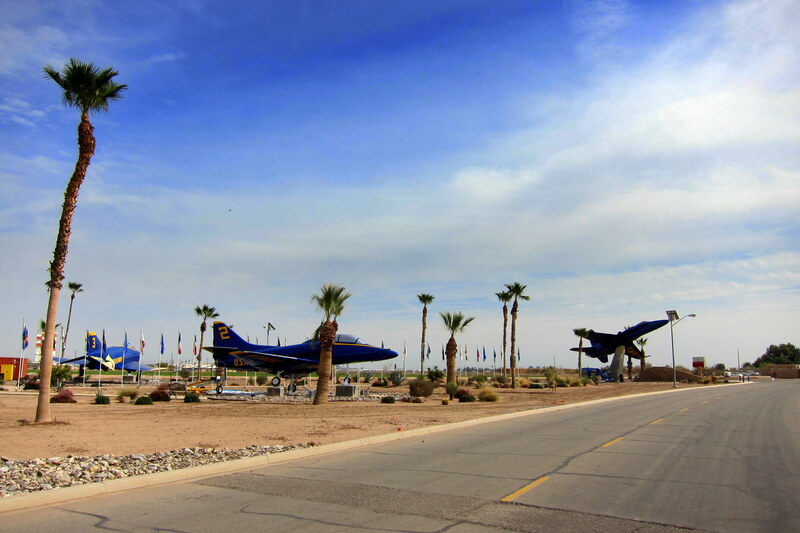 As we drove through the town of Brawley and jumped on CA-86 heading south, she noticed we were approaching El Centro and a possible camping opportunity at the Naval Air Station. Calling the base we were a bit relieved to learn of a few sites available so that bit of good news caused our speed, as well as our mood, to increase. 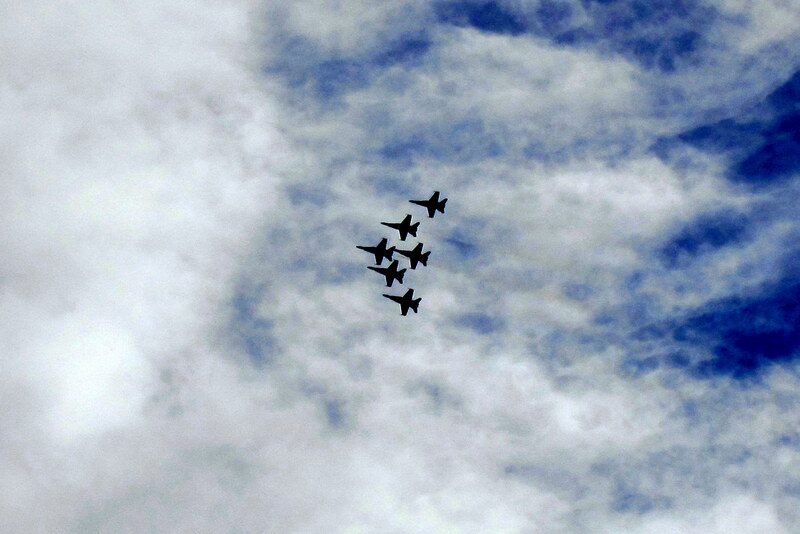 It was 1540 as we pulled into The Palm Oasis RV Park at El Centro Naval Air Field…..which is also the winter training facility for the US Navy’s famed flight demonstration team, The Blue Angels. As if on cue, “The Blues” returning from a training flight, performed a mini air show for anyone lucky enough to be in the area. 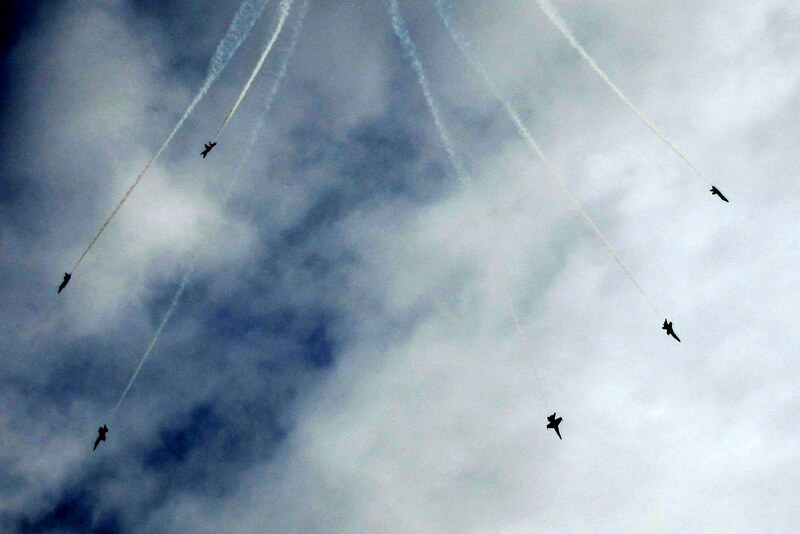 The unexpected treat of aerial ballet caused folks all over the base to crane their necks skyward and shield their eyes while becoming mesmerized by the precision flying of the world’s finest combat pilots. Following that brief and enjoyable interlude, we retired to the camper and got caught up on e-mail and the news of the day. Palm Oasis RV Park has doubled the number of its camp sites since our last visit and has embarked on a major remodeling project. We scored a site in the newer and nicer portion of the park in close proximity to the very much needed laundry. 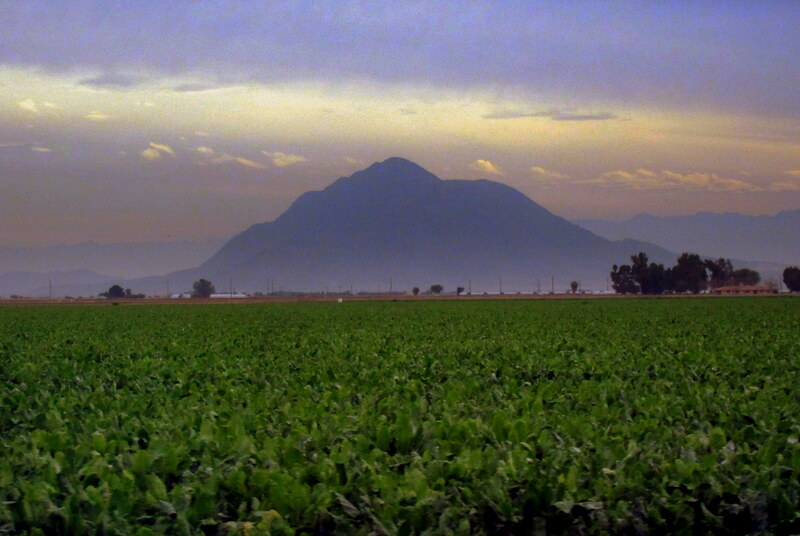 El Centro is el centro to California’s Imperial Valley and the self-described nation’s salad bowel. 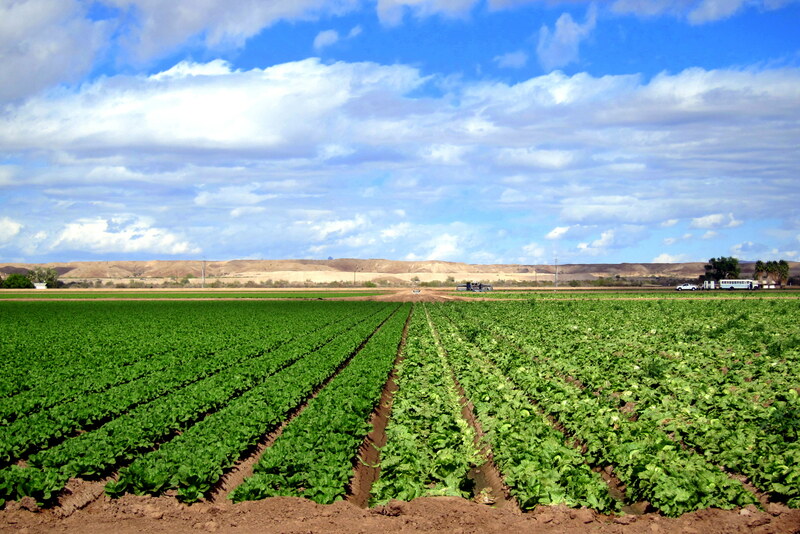 This neo-verdant and extremely productive portion of the Sonoran Desert is sustained by a massive irrigation project called the All-American Canal System. This 80 mile long aqueduct diverts water from the Colorado River to the fields of the Imperial Valley, one of the driest places on earth with an annual rainfall of less than three inches a year. The near perfect weather combined with a year round growing season and plentiful Colorado River water sustains 630,000 acres of highly productive crop land. So, how did the All American Canal come by its name? Well, when the aqueduct was dug back in the early 1900’s it was called The Alamo Canal and part of it flowed through Mexico. Due to canal breeches by los agricultores, much of the water was diverted before it ever reached its intended destination. So in the 1930’s a new canal was dug, wholly within the United States and called…..care to guess? 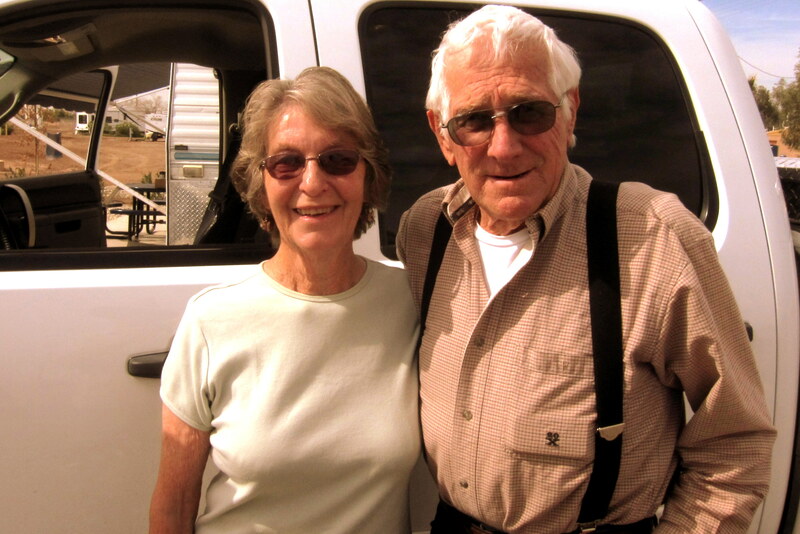 While at The Palm Oasis RV Park, Kit and I visited with a neighboring couple who had just taken the Farm to Feast Agricultural Tour. They learned that the bag of mixed salad greens found in many modern supermarkets is grown and harvested utilizing a special procedure. The farmers intersperse seed of the desired mix within the same row, then when mature a cultivator chops off the upper two thirds of the plants. The periodic harvesting can be accomplished three times before the crop must be plowed under. Can’t vouch for the veracity of her story, but we did notice a large field growing the plastic bags the produce is packaged in! These same folks have a small farm in La Grande, Oregon…..the home of Northwood Manufacturing, maker of our Arctic Fox. They encouraged us to come up for a visit, tour the factory, and stay in one of their full hook up sites they installed on the farm. Thanks, Mary and Gary……don’t be surprised if we show up next to the barn at some point! Using the Find Friends App Kit and I learned that we may be able to connect with some good friends who are on their own RV adventure. Jeff and Cathy are within striking distance for a meet up sometime today if we continue east. They have extensive touring experience on their beautiful 40 foot sailboat but are on their maiden voyage in a Class B Motorhome. Leaving Maine in mid-January, Jeff and Cathy have already seen a significant amount as they trekked their way west. As their vehicle, they selected a Winnebago Motorhome based on the new Sprinter/Mercedes diesel chassis. It is a great unit and can attain an unbelievable 22 MPG…..incredible for any self-contained RV! 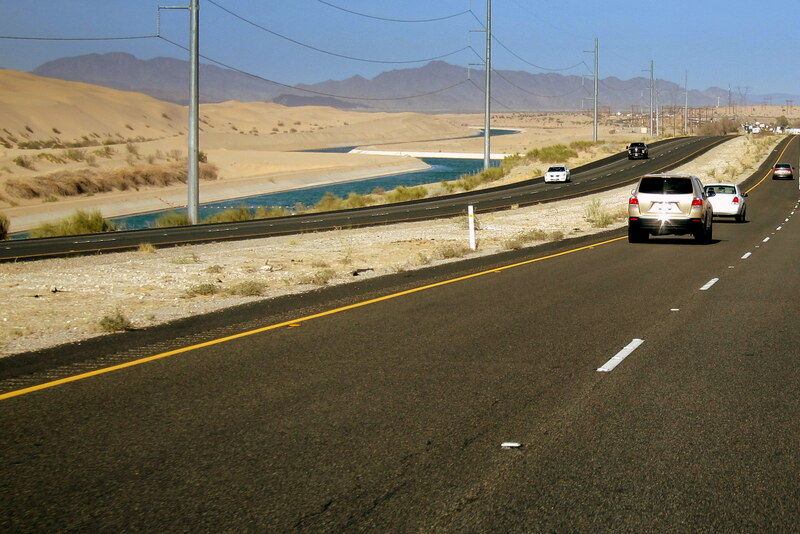 We all decided the best rendezvous point would be near the California and Arizona border. Researching possible camping opportunities Kit and I discover what appears to be a nice and convenient park…..Rivers Edge RV Resort in the aptly named town of Winterhaven! I booked two sites for two days and nodded off thinking of the fun times to come! Kit’s Bit’s: Our time in San Diego this trip has been great!!! We could have easily stayed on another couple of weeks but, alas, we had to move on. Our tribute to Nana turned out beautiful! The weather was perfect, we had very special people with us and everyone had kind words about her. She was a great lady and she would have loved such a nice send off! Our childhood friends, Rodney and JoAnne both remembered her when she worked at Rexall Drug in our local shopping center, which takes us all back to age 12 or so. Our families had fond memories of her when we were young and growing up. Class act, Bill! You did a wonderful service for Nana! Of course, she is still with us in spirit; we see signs of her presence nearly every day. Love you! It was great seeing you as well. Amazing progress on rehab…..nothing like new parts! Another great job guys. The tonneau cover looks just like the one we have for Betty’s new truck. Safe travels. Thanks……how come there are no photos of your new truck on Facebook? Who knew? You know the Friebergers! I worked with Marie and had their children in my classes is Bowdoinham. Love reading about your adventures. The service for your mom sounds very special. Safe travels! We Sagers are in Old Orchard for the weekend…thinking of you! Who knew indeed….it certainly is a small world! Have a great time at the dance, wish Kit and I could join you! Thanks for the nice comment, the memorial was special…..we think mom would have been pleased. Not sure of our trajectory returning home this year. We may take a more northerly route. However, if we are in the same area of the country it would be great to see everyone! GREETINGS FROM SNOWY BOWDOINHAM, 3/6 EXPECTED TODAY AND TOMORRA. WONDERFUL CEREMONY FOR YOUR MOTHER. WEATHER IS STARTING TO SOFTEN A MITE, ALL SMELT SHANTYS HAVE BEEN REMOVED FROM THE ICE. STILL ABOUT 14/16 INCHES OF ICE OUT FRONT. MUCH CONCERN ABOUT FLOODING, SNOW PAC IS 3/4 FEET DEEP ALMOST STATE WIDE. WE DODGED THE 500 YEAR FLOOD SO DON’T EXPECT THAT WILL HAPPEN AGAIN IN OUR LIFETIME!!! WORD IS, THAT SEBAGO WILL BE ICE FREE IN JULY!! SCOTT, MARIE AND DAVE LOOK LIKE THEY ARE ENJOYING THEIR NEW DIGS. Thanks for the news from home. Hope you folks are well and beginning to enjoy more temperate weather. Looking forward to seeing everyone upon our return.